According to the International Diabetes Federation, more than 50 million people in India are diagnosed with the condition of diabetes. About 200 million people around the world suffer from diabetes and this number is estimated to get doubled by the end of 2030. But what causes this lifelong disease? Whatever we eat or drink is converted into simple sugar (glucose) in our bodies. The pancreas, the organ behind the stomach, releases insulin to help the body store and use this sugar and fat from the food we consume. Due to metabolic disorders, diabetes occurs when: the pancreas does not produce any insulin or when the pancreas produces very little insulin. It can also occur when the body doesn’t respond properly to insulin. This condition is called ‘insulin resistance’. People who are diagnosed with diabetes either don’t make insulin or their body’s cells are resistant to insulin leading to high levels of sugar circulating in the blood, called simply high blood sugar. By definition, diabetes is having a blood glucose level of 126 milligrams per deciliter (mg/dL) or more after an overnight fast (not eating anything). 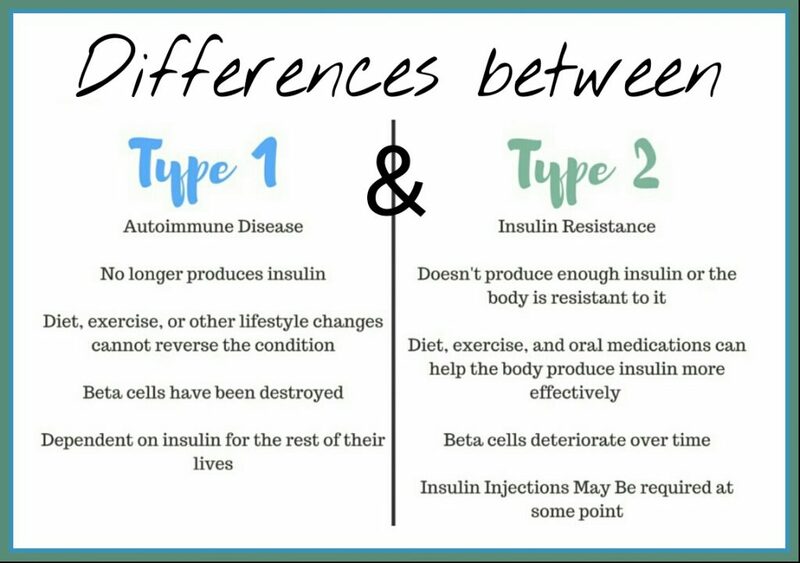 There are two types of diabetes: Type I and Type II. Let us understand both of them in detail below. Type I diabetes is characterised as the insulin-dependent diabetes. The cause of Type I diabetes is the damage occurred in pancreas. The pancreas contains beta cells which produce insulin. When the number of beta cells in pancreas decline, the deficiency of insulin occurs. It appears to the medics that certain genes make Type I diabetes more vulnerable but a triggering factor like a viral infection sets it off. What actually happens in Type I diabetes, the immune system makes a mistake by attacking the beta cells and causing them to die. The body cannot produce insulin without the beta cells in pancreas. When this happens, the glucose builds up in the blood stream and causes high sugar levels. Related Reads: Is Diabetes Curable? The treatment for Type I diabetes comprises a healthy diet and insulin shots. Type I patients are advised to test their blood sugar levels at least four times a day to monitor their blood glucose levels. This is essential to keep the sugar levels within safe limits. If the blood sugar levels are not kept in check, three complications can occur. Ketoacidosis occurs when the blood sugar levels increase to alarmingly high levels due to eating too much or consuming too little insulin, or by stress and illness. When there is not enough insulin in the body, it begins to break down fat for energy and produces chemicals called Ketones. Ketones cause vomiting, difficulty in breathing, excessive thirst, dry and itchy skin and may even cause coma. Hypoglycemia is a condition in which the blood sugar levels drop drastically. Taking too much insulin, eating too little, skipping meals, eating at the wrong time, exercising too much or drinking alcohol on an empty stomach causes hypoglycaemia. Complications like high blood sugar levels can cause damage to the organs. Diabetes can damage kidneys, eyes and nerves and make the patient more prone to heart and blood vessel diseases. By keeping blood sugar levels under control, patients can prevent themselves from these complications. Type II, the most commonly found form of diabetes, is the non-insulin-dependent form of diabetes. About 90% of diabetic patients fall into this category. When the beta cells in pancreas lose their insulin receptors and become less sensitive to insulin, the glucose levels in the bloodstream shoot up and cause Type II diabetes. Generally, people above 40 years of age who are overweight are more prone to type II diabetes. Also read about: Juvenile Diabetes Symptoms. Type II diabetes, which produces mild symptoms can be controlled with healthy diet, exercise and weight loss. The type II patient must monitor his glucose levels and ensure low intake of sugar. The doctor may control type II diabetes by prescribing diabetes pills and insulin shots.